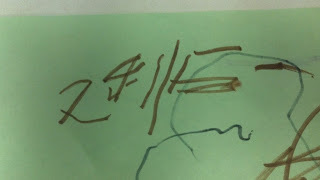 This is Zane's first independent attempt to write his name. I'm so excited! Look at that letter formation. You can clearly see a Z and a captial E.
And in the middle is a 4 and an 11. Still, it's a good first try. I hope that it is not the last. 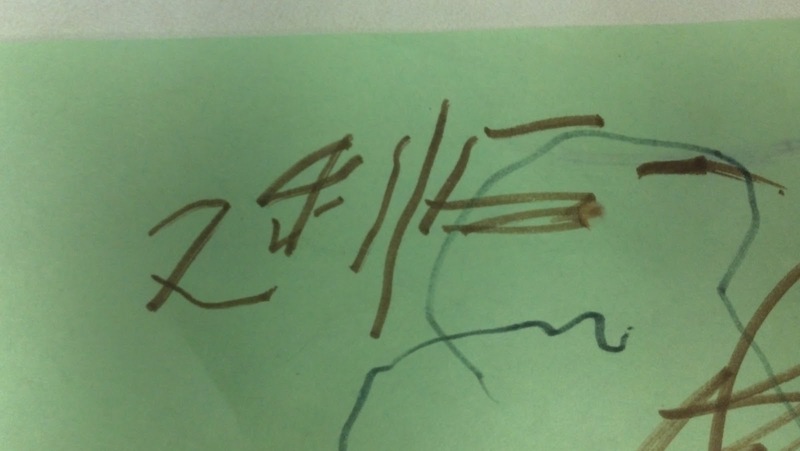 I know that schools don't teach handwriting anymore, and that is just sad. When you are forming a letter with a pencil or pen, the very act of moving the writing utensil in a specific way reinforces memory. Probably there's even research that shows I'm not talking out of my backside. I just find it odd that there is so much emphasis on standardized writing tests when nobody teaches handwriting. To me, they kind of go hand in hand, the ability to create a sentence in the brain and translate it into motor activity. Nothing beats the pen and paper. Don't give me that tripe about how some people just can't write, or they don't want to be embarrassed by what they write. Who said anything about letting anyone see what you wrote? Write a grocery list. Nobody ever said that every word written has to be profound to anybody but the person doing the writing. Pick up the pen and write something. Anything. When I get bored, for instance, I write down the names of the Presidents. (I can never remember that Millard Fillmore dude!) Nothing earth-shattering there. Sometimes I'll put the pen in my left hand and try to write the alphabet, and people in staff meetings look at me funny. My hand gets a workout just the same. I understand that there are people out there who cannot perform the motor activity of writing, and accommodations must be made for those people. Those who can write, however, should write. As often as possible. Even if you are only practicing your signature. That motor activity is important, I just know it. If it goes away, who is to say that anything approximate will replace it? What will those neural pathways become, if they aren't dedicated to handwriting? It's probably those lazy neural pathways that lead to zombies! So get rid of those zombies...write away!!! I think you figured out how zombies are made!!! We have a constant battle with handwriting....I will not give up!!! I have horrific handwriting. It's because I hold my pen wrong. At least that's what a teacher said during handwriting practice in 4th grade. To exercise my hand, I doodle in staff meetings. Letters AND numbers, huh?? He's clearly WAAAaaay ahead of many people twice his age!! !